Tarzan and His Mate (1934). Summer is for climbing trees. “We have a mansion in every glade,” says Jane in Tarzan and His Mate (1934). More accurately, the glades are backyards for Tarzan and Jane, while they spend their nights in impromptu mansions assembled high above in the trees. After her visiting American friends coax Jane into putting on an evening dress, Tarzan sniffs the dress, fingers it curiously, then whisks her off via jungle vine to one of their treetop mansions. Cedric Gibbons, head of the MGM art department, was a master at designing opulent sets. On a daily basis, he oversaw the designs for royal chambers, grand cathedrals, and rich plantation homes. MGM specialized in glitzy displays of wealth. Tree houses were a bit of a stretch for the Gibbons team, headed by A. Arnold Gillespie, especially when the script stressed their simplicity. No jerry-rigged imitations of modern conveniences were called for. Tarzan and his mate shared a cozy little pup tent in the trees, with room for one organic mattress and an animal skin blanket. 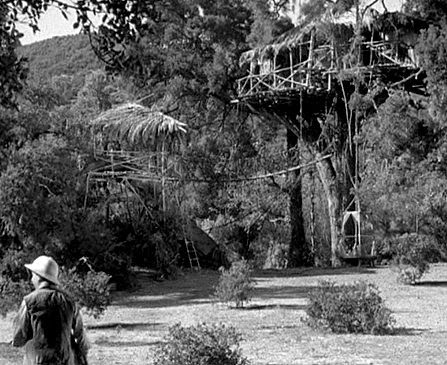 The exterior of Tarzan's tree house in Tarzan and His Mate (1934). 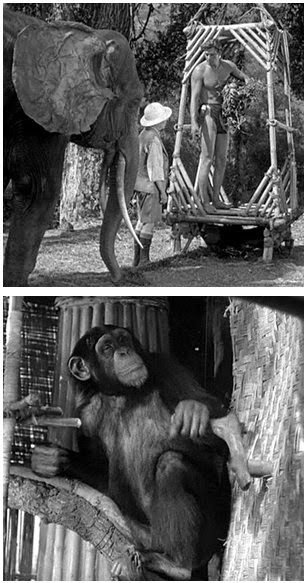 interior of the tree house in Tarzan and His Mate (1934). As one of the last movies to fall into the pre-Code era, Tarzan and His Mate barely scraped past the rapidly increasing pressure from the censors of the Hayes Office in 1934. 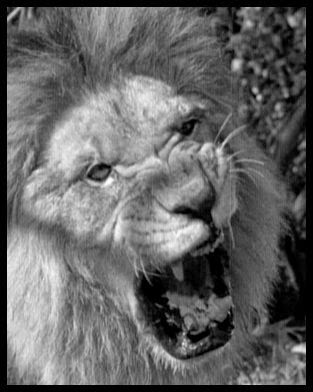 Two years later, with the Code operating in full force, MGM required radical changes in the Tarzan jungle, including a thorough overhaul of the Tarzan family’s living arrangement. In Tarzan Escapes (1936), Cedric Gibbons and his art department provided Tarzan and Jane with a proper tree house mansion with fully-equipped kitchen, a dining room, and guest rooms. Tarzan's townhouse in the trees in Tarzan Escapes (1934). Granted license by the script to build a tree house mansion, the art department set about creating the world’s ultimate arboreal playground. It’s a multi-room extravaganza with an elephant-powered lift, a chimp-powered fan, a wood-burning oven, a complex pulley system for drawing water from the creek below, and a rope bridge that links the main building to a treetop gazebo. 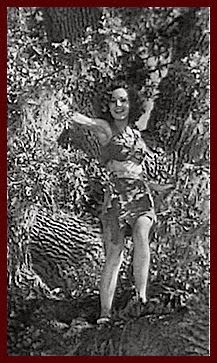 While setting a new standard for tree houses, the new arrangement unfortunately (to the great detriment of MGM’s Tarzan series) domesticated Jane. After taming an ape man and fending off lions in the first two movies, Tarzan Escapes relegated her to the kitchen, in charge of cooking the wildebeest roast. It was an inevitable slide into middle class life for Tarzan and his mate, but at least they’d always have the glorious memories of their pre-Code courtship, when clothes were scantier, every glade was a mansion, and the tree houses were built for two.